Gary Stone holds a record with his collection of phonographs in his home in Broomfield. Behind him on the left is a Victor II Humpback Phonograph from 1904. 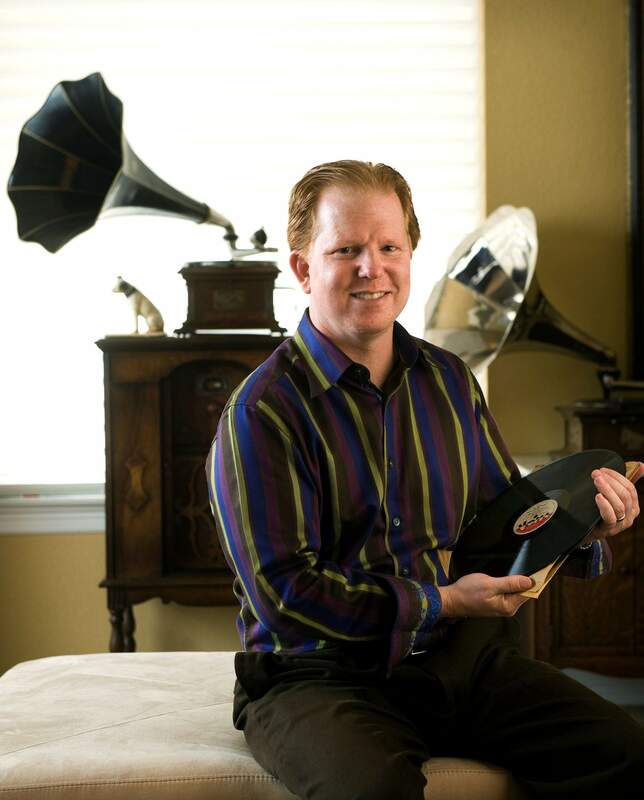 DENVER (AP)  Gary Stone pulled a 78-rpm record from its paper sleeve. He placed the disc, which weighed about as much as a Big Mac, atop a felt-covered turntable. Its mahogany cabinet boasted as much craftsmanship as anything in an Ethan Allen store. A stainless-steel needle hit the platters grooves. There was a crackling, then the vibrant, patrician voice of President Franklin D. Roosevelt jumped out, announcing to Americans that they had just lived through a day of infamy, but that the foe would be fought and vanquished. Every time I hear that I get tingly and emotional, said Stone, who lives in Northglenn. Just listen to the anger in FDRs voice. Hes telling the country were going to war, yet no one could imagine what lay ahead. The lure of owning an aural time tunnel  in this case a Victor II Humpback Phonograph from 1904  is what binds Stone and his fellow collectors in the Old West Antique Phonograph Society. There is also a deep aesthetic appeal. Cabinets were fashioned by master craftsmen from fine woods such as mahogany, quartersawed oak and birds-eye maple. Price tags on the machines run from hundreds to thousands of dollars. Collectors vie for them on Craigslist and eBay. One of his prizes is a Victrola 18 model from 1915. Housed in a burnished mahogany cabinet, the machine cost $315 in its day  more than a car. It was later modified with an orthophonic speaker, an upgrade that was sort of the Dolby system of its day. Its my pride and joy, he said. Stones wife is good-natured about his collection, referring to the parlor as the toy room, though lately she has imposed a buy a new one, sell an old one caveat. She probably hasnt seen Bob Stapels house. On a recent evening, club members descended on Stapels house in southeast Denver. Stapel is a popular figure among these folks, in no small part, because hes a master repairman and restorer of the machines. Stapels house is something of a museum to the early recording industry. The shelves of his workshop, redolent of machine oil, sag with spare parts. Stapel also collects ephemera, and Stone pointed out a turn-of-the-century record-cylinder cabinet that he covets. Im still trying to find one, he said. For Stapel, who an attorney, scoring the wooden box was the result of a practiced eye. Club member Fred Williams delights in cylinder players, where a steel needle traced a mechanical track across a spinning wheel. One of his machines is an Edison General, built in 1899 as an answer to the 1898 Columbia Model Q, with its clockwork motor. Some record collectors specialize, concentrating on vaudeville acts, historical recordings or the works of a specific artist  say, pianist Jelly Roll Morton or Bix Beiderbecke, the cornet titan. There are other collector niches, too. Curt Vogt specializes in the record brushes used to keep 78s clean. They are housed in their original ornate tins, many of them stamped with the colorful logos of the stores that carried them. Vogt pointed to a cabinet holding an array of tins, brands from such labels as Okeh and the American Musician Co.
Stone has several hundred recordings, culled mainly from auctions and to a lesser extent from antiques stores. Stores arent the best place to find things because theyre often picked through, and it takes hours to go through the stocks, he said. The recordings recall another time. Listen to Stones century- old recording of The Star-Spangled Banner through a conical, witchs hat horn, and you hear a version of the song with none of the melisma and swooping vocal tricks found in performers at todays ballgames. The singer gets the words right, too. Funny thing, how once-cutting-edge technology is reduced to an archaic novelty. Sonys Walkman is nearly there. The iPod will be there soon enough. Somehow, it seems doubtful these inventions, in their compact plastic casings, will enthrall people on the cusp of the 22nd century.